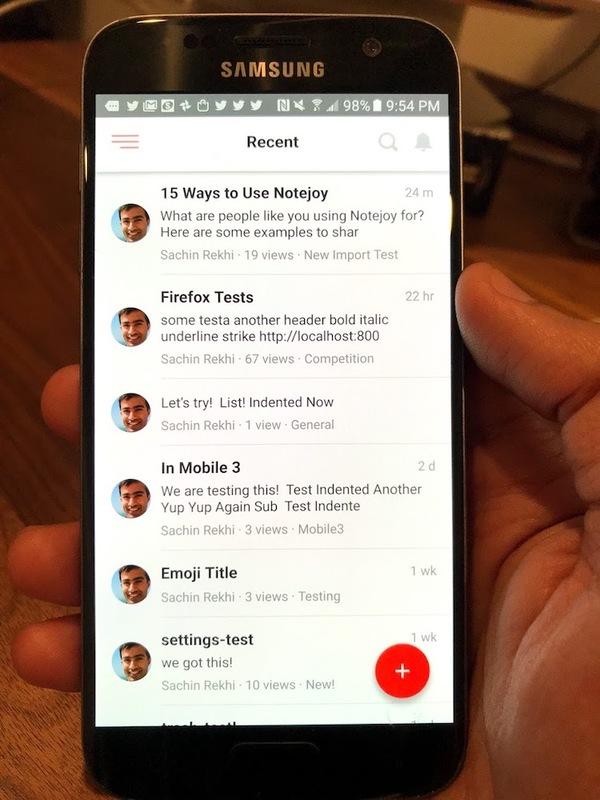 Create an Android app for Notejoy with similar functionality to the existing iOS app. This is an essential feature if it's to become a replacement for OneNote. Being able to add notes and images to ongoing projects from my Android phone is an important part of my current workflow. Please keep me updated on this feature. Half our team has Androids. We need this app if we are going to keep using Notejoy. Everyone in my company has an Android. I agree.. Notejoy team please take a look at taskade.com, it is a similar tool as notojoy but it is free.. and it has some cool feature that you don't. Including android app. Android App please. Thanks. Great job, you guys. This would make life so much easier for my business; not needing to constantly need to open a browser and zoom. I think you should take some of the interface of Nimbus note for the Notejoy Android App. Android App is the most important priority right now!! My team won't get on board with this until there's an android app. Help! More people's use android. So why it not developed first over the iPhone market. Really would like an android app for quick notes and comments on the road. the only thing stopping me from using notejoy is this. any idea when? Please make an android app soon. I am waiting for the application. Yes!!! This would be so helpful! Yes. This is super important moving into the future! This won't work for me without being able to use from my Android phone. So I'll check it out again once you've launched it. With an android app I would definitely switch to notejoy. Notejoy for Android is coming along quite nicely. Here's a sneak peak! @Sachin: looks "yummi", great work. Any clue on a possible publishing date? May I be a beta-tester? My upvote - would love to beta test. We can't wait for the Droid app! Note 8 and Note 9 users want the DroidJoy with Notejoy ! We all can't wait. We are android people! So excited to get the Android app! Yay!! That will be awesome! Yeah, beta testing will be fun! Waiting eagerly to be able to use Notejoy on my (Android) cell phone. I would also like to beta test. Much anticipated apps! Please invite me to be beta tester! Notejoy for Android beta is now live! Download here.